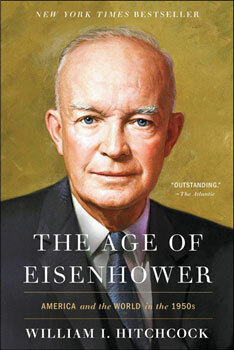 Library Notes: “The Age of Eisenhower” Book Review - Grace Ridge Retirement Community - Morganton, N.C. In this guest blog, Grace Ridge resident Bob Erwin reviews “The Age of Eisenhower: America and the World in the 1950s” by William Hitchcock. The “original and penetrating new book about President Dwight D. Eisenhower” is a New York Times bestseller. My son usually gives me a history or biography for Father’s Day and other events. This book is history and biography at its finest. It is a portrait of a skilled leader who, despite his conservative inclinations, found a middle path through the bitter partisanship of his era. At home, he reaffirmed the central elements of the New Deal, fought the demagoguery of Sen. Joe McCarthy, and began the interstate highway system. The Democrats controlled Congress during much of Ike’s eight years in office, but he was able to work with Democrats due to his popularity with the people. He kept a close eye on federal spending. Due to Ike’s success and World War II, he was known and respected by leaders around the world. Ike ended the war in Korea and kept us out of future wars. He avoided a new quagmire in Vietnam. He charted a significant expansion of America’s missile technology and deployed covert operations around the world to confront communism. He realized that a strong defense for America was the best way for peace. As he left office, he cautioned Americans to remain alert to the military-industrial complex that could threaten their liberties. Ike was the most popular full-term president since World War II. His popularity with the people averaged 65 percent during his eight years as president. John Kennedy was slightly higher, but he was president for less than three years. Today, presidential historians rank Ike as fifth on the list of great presidents. William Hitchcock shows why Ike’s stock has risen so high. I highly recommend this book and I am placing it in the Grace Ridge library.